I would like to know if anyone has actual factual HP and torque gains when replacing everything intake and exhaust related. Like cone filter on cold air intake, new throttle body with aftermarket intake manifold. Then headers to high flow cat or test pipe, followed by cat back exhaust. I have never been able to find one that does everything. I've seen a few air intakes (pipe with filter) say 5-6hp on the d16 I have. 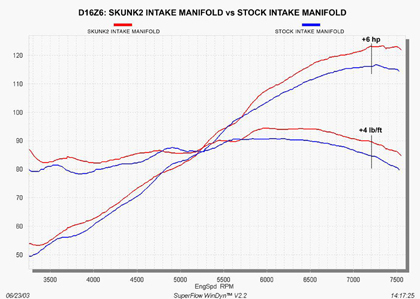 skunk2 says their intake manifold gains I think 6hp. adding a throttle body plus exhaust does that mean 20+ hp... that seems rather high for a 125hp d16z6... anyone have opinion on this? facts would be awesome. Now my feeling is if you put a ram air intake, or cold air or some aftermarket intake it may gain (just for easy numbers i know this is way high) 10.0 HP. and if you take that off and put a skunk2 intake manifold on with stock intake air box you gain (again high for number reasons) 10.0 hp. but when you put both on, since the air intake allows more air to get to the intake manifold they help each other so now you gain 22.0 HP not just 20.0 HP. Is stuff like this true? where the intake helps the throttle body, which helps the intake manifold, which helps the headers gain more, which helps the cat gain more which helps the rest of the exhaust gain more? or am i completely wrong. This is a topic that is beaten to death on a weekly basis. Intake, Header, Exhaust will get you about 3-10hp MAX with no tuning. With tuning, maybe 15hp. With a stock motor, an intake manifold will DESTROY your throttle reposnse and make the car slow as *****. Cay Bypass Pipe Performance Gains? anyone have actual pics of v2? Quick Reply: actual performance gains?